We asked several respected horse people for their opinions on such competitions. “One of the key elements for good equine welfare is ‘freedom from fear and distress.’ Sadly the often subtle signs of fear, distress and anxiety in horses are little-known and often misinterpreted resulting in empty assurances and welfare standards that are not upheld. Taking young horses to a competition such as this one goes against everything we know about how horses learn to cope with new situations. Methods such as the ones advertised might ‘work’ but not for the reasons claimed. 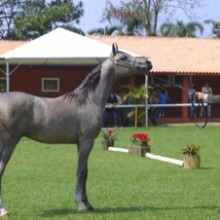 Many natural horsemanship methods are based on the erroneous assumption that horses need to be ‘dominated’ in some way to reflect how horses communicate with each other. The ‘obedient’ horse at the end of such training has learnt that if he/she doesn’t do what the human requires something bad will happen and in some instances they ‘give up’ because they are so fearful for their survival. This is not compassionate training and has no place in the modern world. “I find it unbelievable that in the 21st Century humans have not fully understood how to be with horses, and therefore an event like this is being introduced to the UK. A considerate horse-focussed trainer will surely know that calm, quiet handling of a youngster is how to start a horse, away from the stress of a public ‘show.’ In my experience, when a person has an open mind you can tune in to common sense about horses and their needs. It’s when the mind is closed that the horse’s communications and sufferings gets missed, and the human ego is revered above all else. “This is not the way to start a horse, which should be done from birth and slowly over the next 4-6 years. There is simply no need to show starting, it is a step backwards and something we really don’t need. Unfortunately at the core of the event you have something that is not a celebration of the horse but a celebration of the trainers. Horsemanship is in evolution and one day I hope the competitors and organisers will look back on this event and know it was an unnecessary exploitation of the horses true and wonderful nature. They are pretty unanimous in their opinion. What’s yours? Please let us know in the comments below.